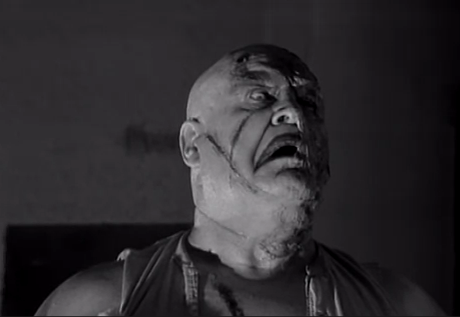 Night of the Ghouls is a 1958 horror film (not released until 1984), written and directed by Ed Wood, and a sequel of sorts to the 1955 film Bride of the Monster. Tor Johnson returned to the role of Lobo, first seen in Bride, Paul Marco plays the familiar character of Kelton, while the Amazing Criswell plays himself in the frame story of the film. Another returning character is Police Captain Robbins of Homicide (although he is played Harvey B. Dunn in Bride, and by Johnny Carpenter in Night. However Dunn does appear in Night, albeit playing a different character). Although the film was shot in 1958, it was not released theatrically or on television, and was thought to be lost. It was finally released directly to video in 1984. Ed Wood finished the principal photography and rough cut of the film by late 1957, but could not financially afford paying for the post-production work. In 1958, the film laboratory opted to keep the negative film footage until the bill could be paid, and it remained unpaid for nearly three decades. By the 1980s film historians either considered Night a lost film or suspected that the film never existed in completed form, since there was no evidence it was ever released theatrically nor ever shown on television.